This wonderfully pine-scented green Rhode Island soap is handcrafted using Fraser, Balsam, Douglas, and Canaan Fir needles harvested at Bedrock Tree Farm in New England. The bar shows the outline of the state of Rhode Island with RI, the abbreviation for Rhode Island on it. 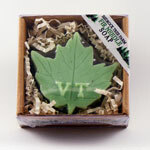 Each soap weighs approximately 4 ounces and is packaged with crinkle in a shrink-wrapped kraft gift box with clear top. Box dimensions are approximately 3" by 4". The soaps have natural melt and pour bases and are made with fresh fir needles and dried powder, fir needle fragrance and essential oils. The dye is formulated with eco-friendly ingredients; does not contain hazardous solvents or additives and is never tested on animals. They contain no detergents or sulfates. The soaps contain vegan (vegetable origin) glycerin. In humid conditions glycerin absorbs moisture from the air causing a harmless glycerin dew to collect on the soap. It doesn't affect the quality of the soap and can still be used normally. To help minimize the collection of dew, we wrap all the soaps in shrink film.